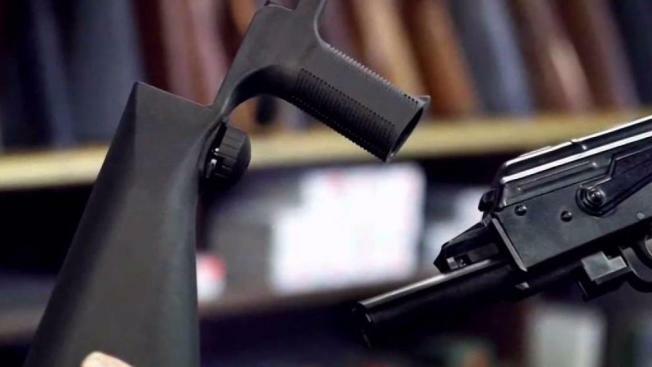 This Oct. 5, 2017, file photo shows a bump stock device (left), that fits on a semi-automatic rifle to increase the firing speed, making it similar to a fully automatic rifle, next to a AK-47 semi-automatic rifle (right), at a gun store in Salt Lake City. A challenge to the Trump administration's ban on so-called bump stocks was rejected in a federal court in Washington on Monday, NBC News reported. The device allows a semi-automatic rifle to work like a machine gun. One was used in the massacre of dozens of people at a concert in Los Vegas in 2017. In December, the Justice Department announced that people will be banned from selling or possessing such devices starting March 26. The Firearm Policy Foundation and others argued in court that the rule "smacks of agency abuse" but U.S. District Judge Dabney L. Friedrich said they failed to prove their case.